Beijing: US officials held “constructive” talks in Beijing, Treasury Secretary Steven Mnuchin said on Friday, concluding the latest round of dialogue with China aimed at resolving the bitter trade dispute between the world’s two largest economies. Mnuchin and US Trade Representative Robert Lighthizer were in the Chinese capital for the first face-to-face meetings between the two sides since President Donald Trump delayed a scheduled March 2 hike in tariffs on $200 billion worth of Chinese goods, citing progress in negotiations. “@USTradeRep and I concluded constructive trade talks in Beijing,” Mnuchin said on social media network Twitter. “I look forward to welcoming China’s Vice Premier Liu He to continue these important discussions in Washington next week,” he added, but gave no details. Earlier, he told reporters US officials had a “very productive working dinner” on Thursday. He did not elaborate and it was not immediately clear with whom he had dined. Trump imposed tariffs on $250 billion of Chinese imports last year in a move to force China to change the way it does business with the rest of the world and to pry open more of its economy to US companies. Though his blunt-force use of tariffs has angered many, his push to change what are widely viewed as China’s market-distorting trade and subsidy practices has drawn broad support. Lobbyists, company executives, and US lawmakers from both parties, have urged Trump to not settle simply for Beijing’s offers to make big-ticket purchases from the United States to help reduce a record trade gap. Neither side immediately offered details on the latest talks, and the US delegation was expected to leave Beijing on Friday evening without releasing a formal statement. 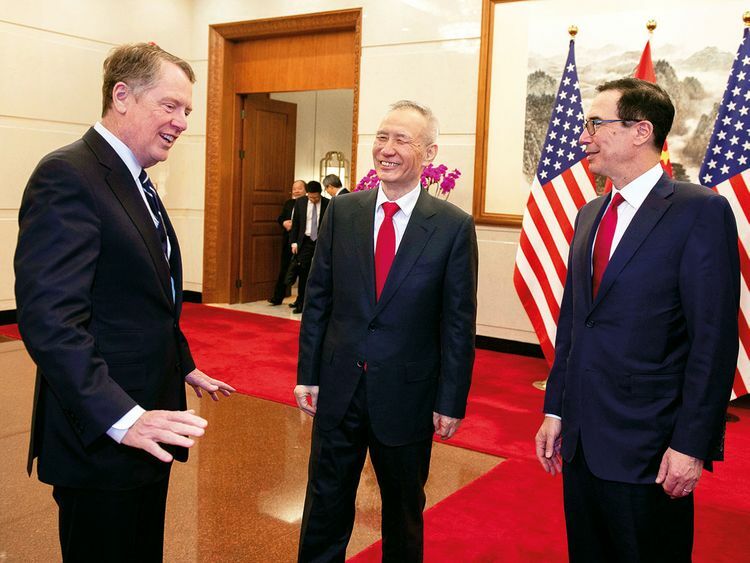 Mnuchin and Lighthizer greeted a waiting Liu at the Diaoyutai State Guest House just before 9am (0100 GMT), and in two brief appearances before journalists, the three mingled and joked with members of the opposite teams. Trade watchers had anticipated the scope of this round of talks, which wrapped up about 24 hours after the US delegation arrived, to be quite narrow, but that both countries hoped to signal they were working hard toward a resolution. It was unclear how much progress was made on the phrasing of those agreements, but earlier in the week a US administration official told Reuters that Lighthizer and Mnuchin were “literally sitting there going through the texts”, a task typically delegated to much lower levels. One person with knowledge of the talks said “translation is definitely an issue”, referring to discrepancies between the Chinese and English-language versions. On Thursday, Premier Li Keqiang said Beijing would sharply expand market access for foreign banks and securities and insurance companies, fuelling speculation that China may soon announce new rules allowing foreign financial firms to increase their presence. White House economic adviser Larry Kudlow said the United States may drop some tariffs if a trade deal is reached, while keeping others in place to ensure Beijing’s compliance. Many have expressed scepticism whether whatever deal they reach will end the trade war once and for good. “Either the purchases are going to be off, or the market access is not going to be there. And then the question is, when do you consider putting tariffs back on?” he added. “The trade issue is not going to be put to bed.” Trump’s demands include an end to Beijing’s practices that Washington says result in the systematic theft of US intellectual property and the forced transfer of American technology to Chinese companies. US companies say they are often pressured into handing over technological know-how to Chinese joint venture partners, local officials or regulators as a condition for doing business in China. The US government says technology is often subsequently transferred to, and used by, Chinese competitors. The issue has proved tough for negotiators as US officials say China has previously refused to acknowledge the problem exists to the extent alleged by the United States, making it hard to discuss resolution. China says its laws enshrine no requirements on technology transfers, which are a result of legitimate transactions.